Sophomore Viktoria Farian sets up her serve during a Seton Hill volleyball game last season. Photo by D.Clark/Setonian. 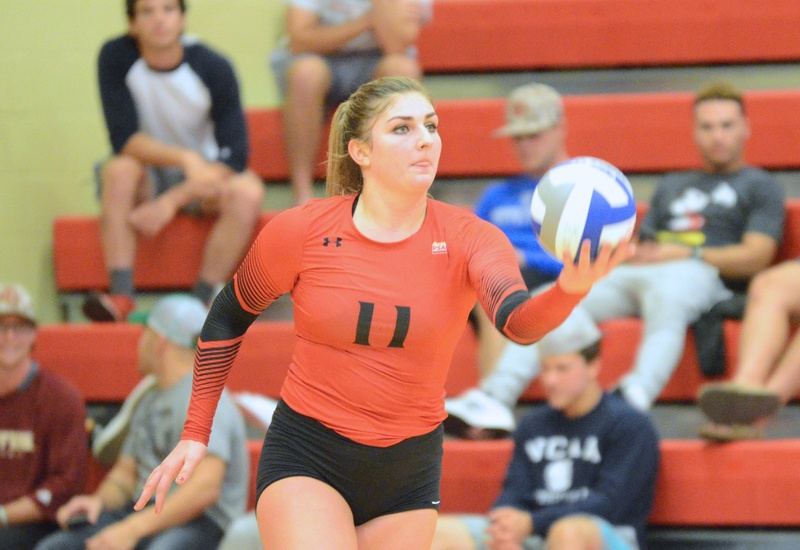 “Communication, passion and effort definitely are a few of the assets that contribute to our exceptional performances,” said Umari Stroud, a sophomore on the Seton Hill University volleyball team. Stroud, along with her teammates, had one of the most successful volleyball seasons in SHU history last year. They ended their previous season with a 22-8 record and took part in the NCAA Atlantic Regional for the first time in three seasons, but ended the year with a loss at the University of Pittsburgh at Johnstown. Despite this ending, this year’s team has already been selected as the preseason favorite in the PSAC Southwest Division, the same division they placed second in last season. The team began their season by completing the Eckerd Tournament with a 2-2 record and the Malone Tournament with a 5-3 record. The first two home games of the new season were against Bloomsburg University and Lock Haven University. The Griffins won both of the home games 3-0. Stroud attributes the team’s successes so far to a lot of productive practices. However, she will not be satisfied unless these wins continue. Some have even started to notice these extra efforts from the volleyball team. The athletic live streamer for the volleyball games, Mark Nealon, said during the first home game that he could already see a positive change in the team. As of Sept. 26, there are 15 more matches and the PSAC tournament still to come, so it is still unclear whether or not this year’s team will have as much success as last year’s team. According to Stroud, the team has learned from last season and they plan on doing even better. The next opportunity to see the Griffins in action is scheduled for 7 p.m. on Sept. 28 in McKenna Gym against Slippery Rock University.